As parents, we want to nurture courage in our children. We want to raise boys and girls who will stand up for what’s right even when they’re afraid. The very idea of fear is part of the definition of courage: courage is not the absence of fear, but doing what is right even when fear is present. In raising kids of courage, the most important thing we can do for our children is pray that God would give them hearts of courage. God says He has not given us a spirit of fear, but of power and strength. God can put that kind of heart in the hearts of our children. We can also model courage and a reliance on God for strength in front of our children. Do our children see us running from difficult situations or doing things in spite of our fears? We, as parents, play a greater role in influencing our children’s lives than anything else (apart from God, of course). For me sometimes that’s a scary thought. I’ve seen both the bad and good that I’ve modeled showing up in my children’s lives. There are also many excellent models of courage that we can share with our children. Of course, Scripture is filled with godly heroes, but many examples can also be found outside of scripture. Children are looking for role models, so let’s fill their lives with courageous heroes they can aspire to follow. The books in this list will give your children characters that promote virtue and bravery in the face of difficult situations. The books are roughly organized by age level with the younger level books at the beginning. When ten-year old Tommy meets a wounded Yankee soldier, he has to make a difficult decision about what’s the right thing to do. A young boy learns that it takes a lot of courage to make a wrong right. This is another true story about a young boy who get separated from his boyscout troop on a hiking trip in a mountain wilderness. For nearly two weeks he has to fend for himself against cold, rain, bears, hunger, and the fear that he will never be found. Paula is a young orphaned girl that goes to live with her non-Christian uncle and his family. By always living for others and following God without wavering, she changes the life of the little village she is a part of. This book is available free on Kindle. Carrie Talbot is heading west with her parents when she is snatched away by an Indian raiding party. As she rode off helplessly with her captors, frantic thoughts raced through Carrie’s mind. Why was one of the Indians so interested in the family Bible she had managed to save? How could she escape? Even if she did, how could she ever find the wagon train again? Eleven-year-old Hammad makes a promise to his blind baby sister to always take care of and protect her. This promise launches him on an adventure that will take all the courage he has. Harriet Tubman was born a slave on a Maryland plantation in the 1800’s. She trusts in God, but her faith is tested at every turn. Should she obey her masters or listen to her conscience? This story from Harriet’s childhood is a record of courage. Even more, it’s a story of God’s faithfulness, as He prepares her for her adult calling to lead more than 300 people out of slavery through the Underground Railroad. A children’s version of Bunyan’s classic Pilgim’s Progress. Christian and Faithful show great courage on their trip to the Celestial City as they face lions, giants, and people hostile to their faith, and many other dangers. This story is worth reading and re-reading at every age and there are many versions available. My boys have also really enjoyed the Dangerous Journey – an abridged version with detailed illustrations that uses Bunyan’s original wording. (However, their girl cousins found the pictures rather gruesome.) For older children, look for unabridged versions. In The Shining Sword, Lanus must fight for the King against the forces of evil. The book is a powerful allegory that teaches the importance of putting on the full armor of God. Also, look for the sequel Song of the Trumpet. Rudi Kaplan is a Polish boy who struggles for survival during World War II. The only thing that sustains him is his father’s promise and the greater promise made to him by his Heavenly Father. When Franz Bedke and his family leave Germany because their secret work of hiding Jews is under suspicion, Franz is relieved to no longer be living in fear. However, to Franz’s dismay, soon desperate Jews are finding their way to the Bedke’s new home in Poland. During a surprise raid, Franz is captured along with Karl, a young Jewish boy. As they escape to freedom together, Franz grows in his understanding of why his parents risked all to save the lives of the Jews around them. Another World War II book. Since World War II was such a dark time in history, it is also a time when stories of bravery shine brightly. This is the story of a young girl in Nazi-occupied Denmark. She is sent on a dangerous mission to save the life of her best friend. If you’re looking for courageous heroes for your children, you don’t have to look further than the lives of missionaries. There are probably few people who face such hardships and danger. I’ll list just a few books, but there are many more available. Adorinam Judson faced difficulties, illness, prison, and death of family members to bring the gospel to Burma. Corrie Ten Boom’s story is unforgettable and life-changing. In the middle of appalling conditions in a German concentration camp, she doesn’t lose her faith in God. Who can forget her determination to be thankful for all things, even for the fleas? Check out other books by Jane and Geoff Benge. For older children, don’t miss The Hiding Place, an autobiographical account of Corrie’s life. Like Anne of Green Gables, Amy Carmichael was known in her childhood for meaning well but getting into all kinds of trouble. She carried this indomitable spirit with her onto the mission field as she worked to rescue little girls from a life of depravity in the heathen temples. With Daring Faith tells missionary stories focusing on Amy’s own childhood, the children she rescued, and her ministry of bringing the gospel to India. 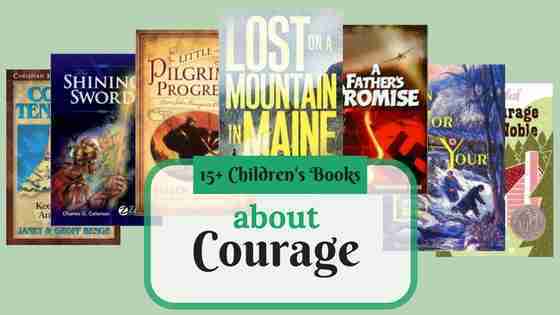 I’m sure there are many more children’s books about courage that I haven’t mentioned here. I’d love to hear some of your favorites in the comments below. Suzanna, what a great list of books! I’m going to pin this and select several of them for gifts in the near future! Thanks for sharing on #LMMLinkup. We love giving books as gifts as well! Thank you!!! I am so thrilled and excited for this list!! Thanks for including me! I enjoyed working with you and Leslie. What a terrific list, several of which are new to me! I love the courage centric focus and will consider steering my own children this direction diring our next library visit. Thank you! I hope you find something great on your library trip! My mom was so good about reading to me and my siblings when we were small. And when I was finally able to read on my own, I could fly through books on my own. So many books helped to shape me into the person that I am, and I particularly remember Number the Stars. I’m glad you included it on this list. You’re blessed to have a mom who read to you. I just recently read Number the Stars for the first time and really enjoyed it. Thanks for stopping by! This is a fabulous list! Pinning! Thanks for sharing this at Booknificent Thursday on Mommynificent.com! Hi Tina, Thank you and thanks for hosting! I’m glad you found the list helpful. We love giving books as gifts as well! Tears stood in my eyes as I listened to my son pronounce the words to his speech therapist. "Cat, cut, cow, call." First the hard c sound at the beginning of words, then in the middle, then at the end. Then the same with the hard g. I was amazed. Every single c and g (at the beginning, middle, and end of words) was perfect.